If you need flexibility and control with your shoe storage, look no further. You can efficiently keep your items organized with the Whitmor's 36-Pair Over-the-Door Resin Shoe Rack in white. It is coated with durable resin for a glossy and shiny appearance. If you need flexibility and control with your shoe storage, look no further. You can efficiently keep your items organized with this rack. The non-slip steel bars on this over-the-door rack ensures that your shoes don't fall off. The unique flip up bar feature allows you to store shoes of all sizes with ease. You can easily hang this Whitmor over-the-door shoe rack with the help of an included hook. Assembled dimensions 7.5"x22.63"x74.5". Whitmor is a 4th generation family-owned and operated business. Since 1946, Whitmor has been dedicated to bringing organization home by creating products that simplify everyday life. Ensuring that those products are built with integrity, value, and innovation is our commitment to you. And our promise is that we will always be here for you should you ever need us as we stand behind our product 100%. Whitmor customer service is available in English and Spanish Monday through Friday from 8 am - 4:30 pm in your language. Stores up to 9 pairs of shoes, Additional bottom storage for slippers. 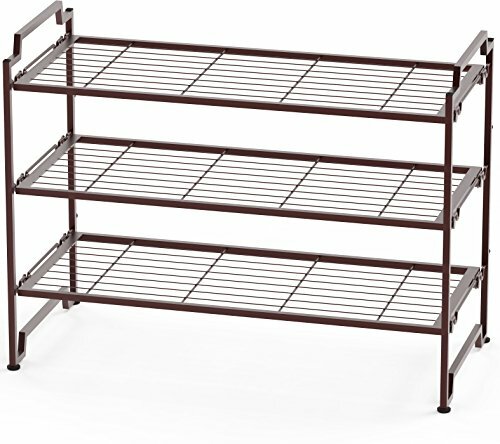 Sturdy Metal Construction with Classic Bronze Coating, each shelf holding up to 30 lbs. Easy Assembly Personalized Storage: Purchase more units to build both horizontally and vertically. This 31" Horizontal Stackable Shelf Organizer is perfect for shoes, sweaters and more! The organizer is a 31-inch wide, two fixed shelf stackable unit that is easy to install and saves valuable floor space! 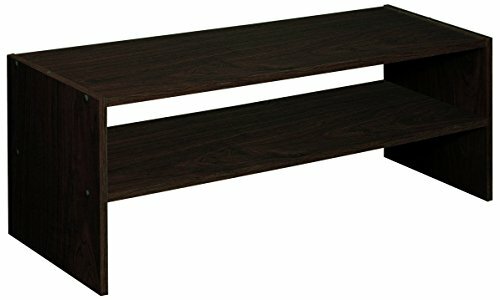 Constructed of wood laminate and available in your choice of Espresso, Alder, Cherry or White finish! Don't forget, this organizer is fully stackable with duplicate units, so feel free to order as many as you need! Assembly level/degree of difficulty: Easy. Have a love for shoes but short on space? Tired of tripping over your familys boots and sneakers as you walk in the door? Just looking for a better, more efficient way to keep your collection organized? Whitmors 50 Pair Rolling Shoe Rack is the perfect solution for you! This convenient, vertical solution allows you to regain floor space and say goodbye clutter! Ten tiers of nonslip tubes can accommodate both men and women's shoes, from loafers and boots to heels and flip-flops. 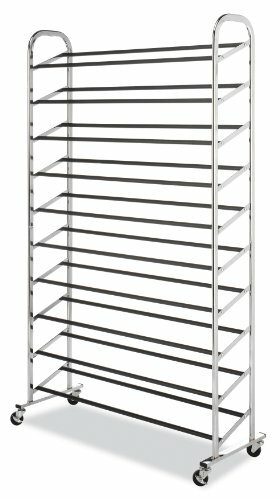 Constructed of heavy-duty metal with a shiny chrome finish, Whitmor's 50 Pair Rolling Shoe Rack is durable, portable, and attractive. Whitmor is a 4th generation family-owned and operated business. Since 1946, Whitmor has been dedicated to bringing organization home by creating products that simplify everyday life. Ensuring that those products are built with integrity, value, and innovation is our commitment to you. And our promise is that we will always be here for you should you ever need us as we stand behind our product 100%. Whitmor customer service is available in English and Spanish Monday through Friday from 8am - 4:30pm CST. Call us and we will gladly assist you in your language. Warranty: For replacement parts or assembly questions call 1-888-whitmor.